Last night was the first night of Passover. 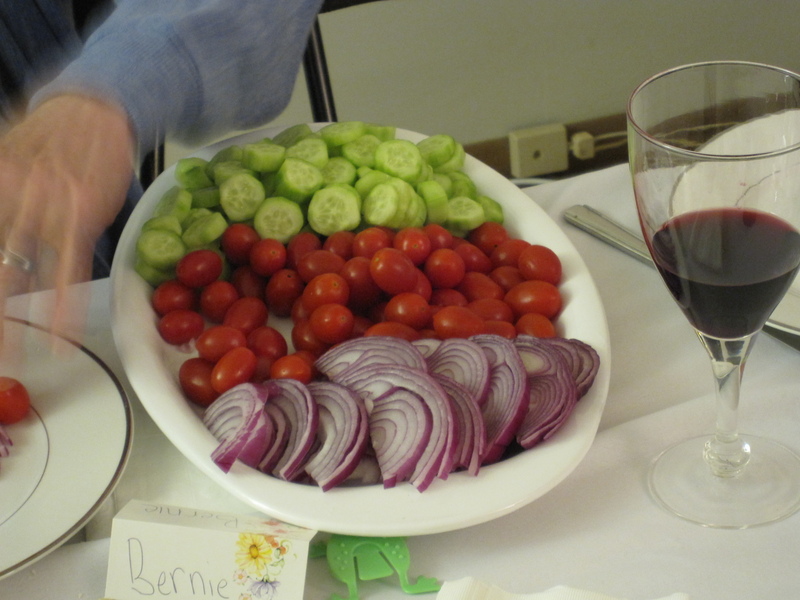 In America, typically the first two nights of Passover are a huge deal in the Jewish household (in Israel they only have Seder on the first night). Families get together for big feasts of traditional foods and celebrate the liberation from Egypt led by Moshe himself, called a Seder. I do want to state that I am not religious, I’m atheist. However, I am culturally Jewish and thoroughly enjoy a meal that consists of Matzah Ball Soup and slow braised Brisket. This year my brothers and I had the first night at our cousins with my mom’s side of the family. 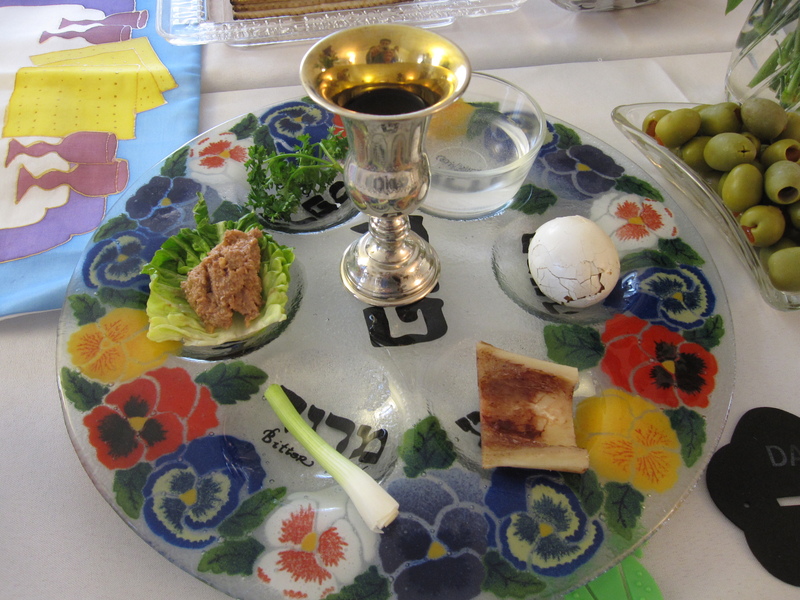 Here is the traditional Seder Plate that sits in the middle of the table. It contains the symbols of the Passover story. 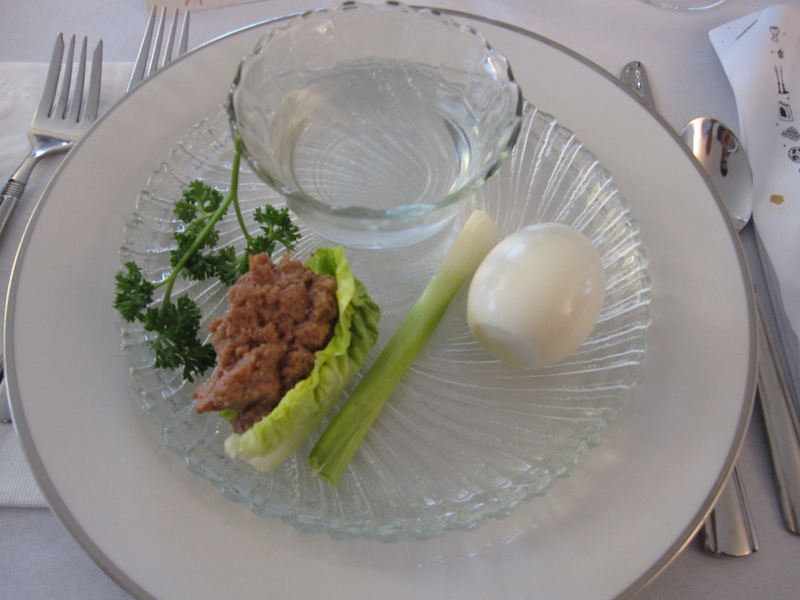 Starting at 2 o’clock is the Beitzah, a roasted egg that symbolizes the festival sacrifice. Then is the Zeroa, a roasted shankbone symbolizing the lamb’s blood that was marked on doors to keep the Jews safe from the 1oth plague. After that is the Maror, we use green onion to remind us of the bitterness and harshness of slavery. 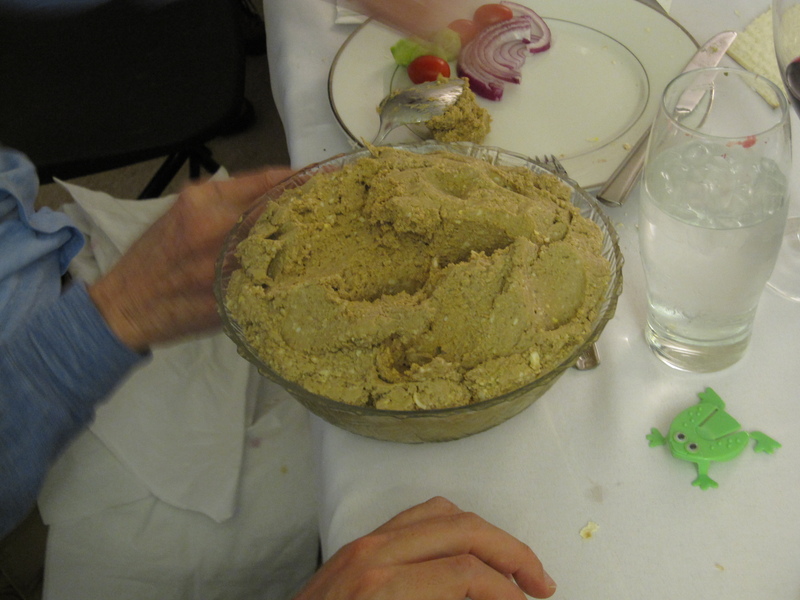 Charoset is next, apples, honey, walnuts, and wine that are blended into a thick paste representing the mortar used by Jews in constructing Egyptian storehouses. Next is Karpas, parsley is used for the coming of Spring. There’s a bowl of saltwater that is used to show the tears shed by Jews in slavery. You dip the Karpas into the saltwater. Finally, in the middle is a glass of wine that’s set aside for Elijah the prophet. At each individual seat there’s a small plate with the edible symbols. 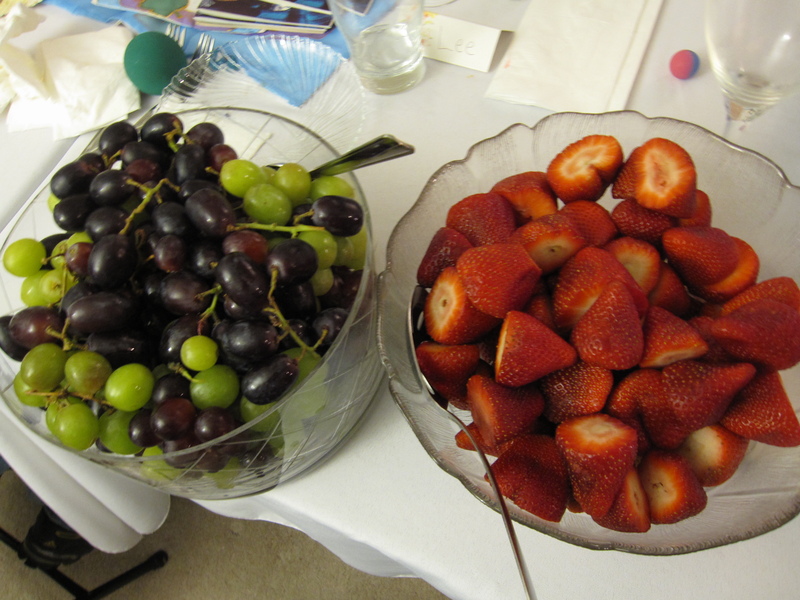 After we get through the Haggadah and eat the Seder plate dinner gets started. 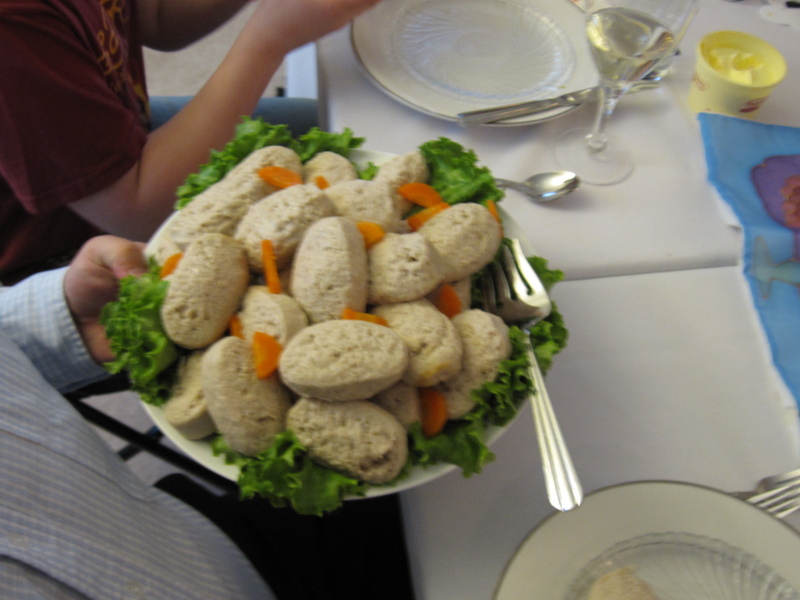 The first thing that get’s passed around is Gefilte Fish. It’s basically a classic Eastern European fish dumpling made out of whitefish and pike. It’s eaten with horseradish. Next is the Matzah Ball Soup. I had two matzah balls, but had already cut them up into bite sized pieces when I remembered that I needed to take a photo. I also forgot to take a pic of the matzah, but that isn’t the end of the world. 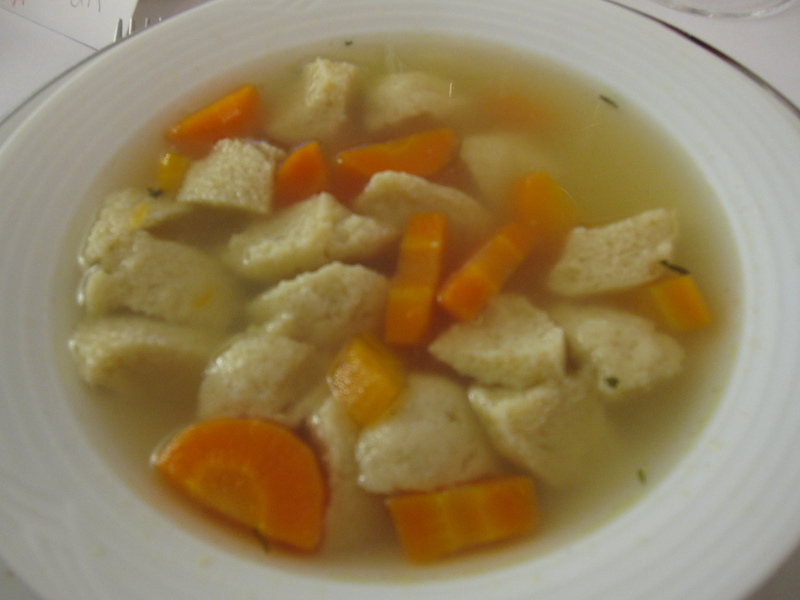 I do have to say that my Matzah Ball Soup is far superior, but that’s always the case. Then some fresh vegetables. Cucumbers, tomatoes, and red onions. Here’s Grandma’s chopped chicken liver. Unfortunately it’s the only thing she makes anymore. She cooks up the livers, seasons them, and mashes it all down. My cousin Lorrie has to salt it though. Grandma’s taste buds aren’t quite what they used to be. But hey, she’s 86! She gets a pass. 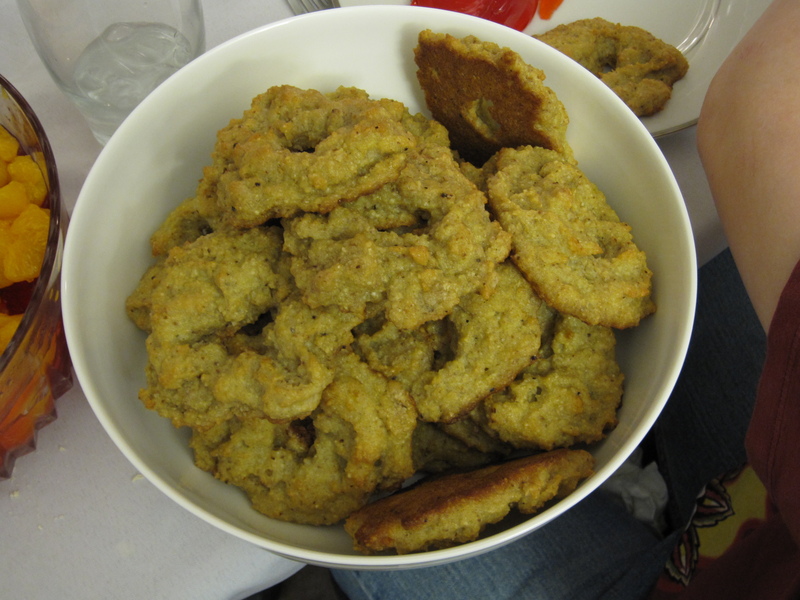 Some bagels made out of matzah meal. They resemble bagels in shape only, but they aren’t bad. 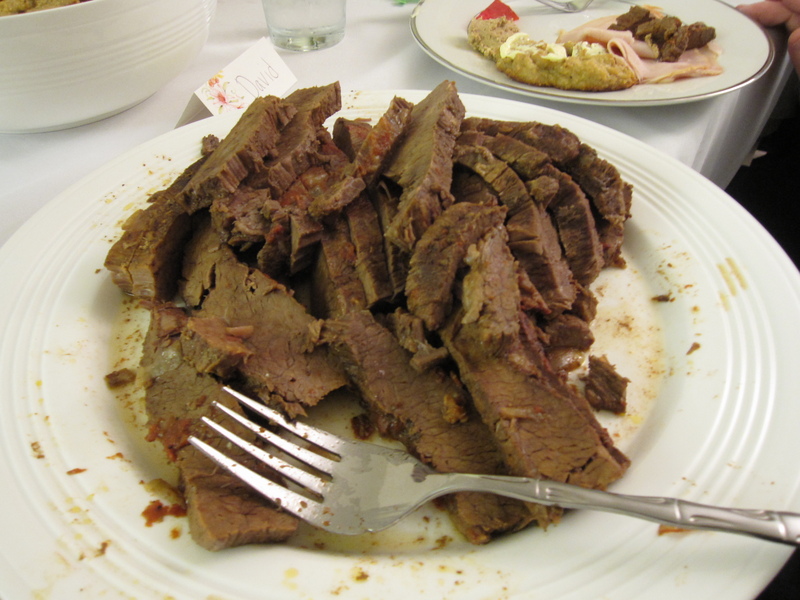 Here’s the famous slow-braised Passover Brisket. Brisket is to Passover what turkey is to Thanksgiving. Again though, my brisket is better. I made the brisket last year, but not this year. I need to take charge of it again for the betterment of all our digestion. 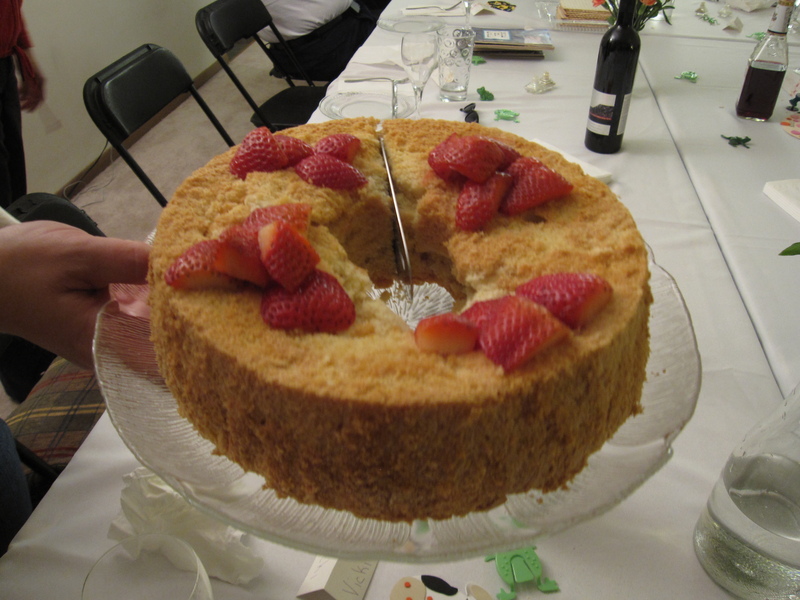 Dessert consists of various cakes made with matzah meal flour and fresh fruit. 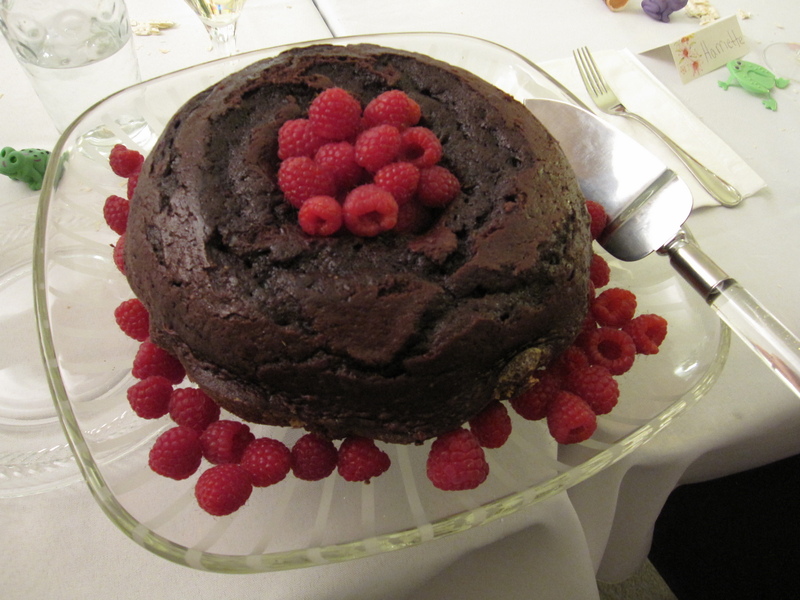 Chocolate cake with raspberries, strawberry shortcake, brownies, carrot cake, grapes and strawberries. 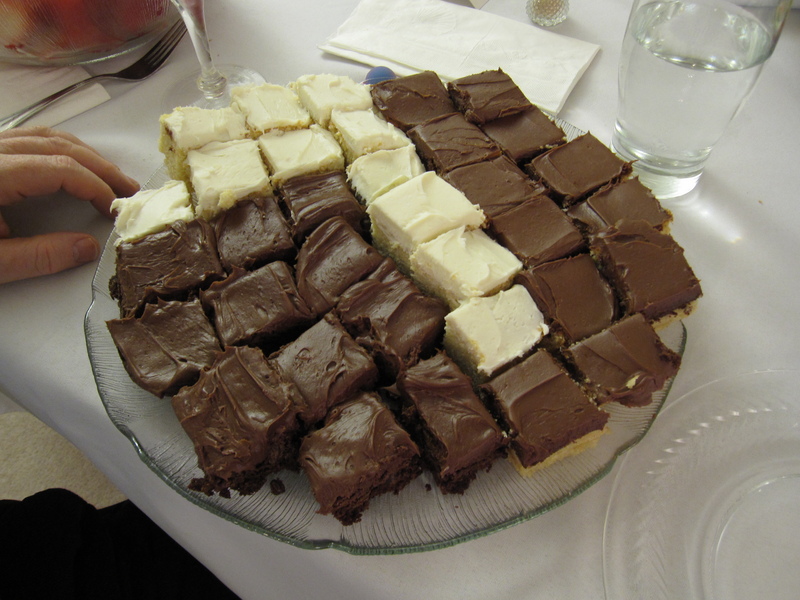 For some reason I always tend to eat too much at Seders.